Imagine fire-fighting tools that are smaller, lighter, and easier to operate than traditional fire extinguishers. That’s exactly what Shield Fire Protection has created. The company’s aerosol spray cans contain fire suppressants designed to fight specific blazes. Kitchen Guard is formulated for cooking oil and grease fires, and Home Guard is engineered to tackle common household fires involving wood, paper, fabrics and plastics. 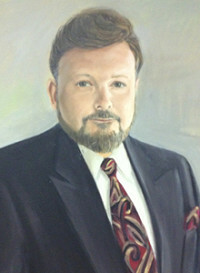 The parent company of Shield Fire Protection, founded by Tom Bower, has been making fire-extinguishing products in the U.S. for more than 40 years. The agents inside its aerosol sprays have been proven to work in commercial and industrial environments. Kitchen Guard contains the same extinguishing agent used by restaurants to protect deep fat fryers, and Home Guard contains the agent used by fire departments to fight fast-spreading forest fires. If a fire ignites in your home, first reactions are critical. Traditional fire extinguishers can be intimidating; they’re bulky, unfamiliar, and hard to handle. Aerosol sprays are easy to use -- we’ve all discharged plenty of spray cans -- and they’re small enough to keep handy in a kitchen cabinet or on a shelf. As a new addition to your home safety kit, a Shield fire suppressant spray could be your best defense to extinguish a small fire before it grows. Quick - something on your stovetop has just started on fire. What do you do? Do you have a fire extinguisher? Do you know how to use it? Have you been testing it weekly like the user manual recommends? When panic sets in, you shouldn't have to think, just act. That's why our easy to use aerosol based fire suppressants should be in every home. My name is Amy and I'm here to answer any questions you have. I was about to buy but first did some research. how do you respond to the below from Consumer Reports? Protection Kitchen Guard. We tested two aerosol fire sprays, the First Alert Tundra and the Shield Fire Protection Kitchen Guard, and have judged each as Don't Buy: Performance Problem. Unlike the extinguishers we tested, neither has a pressure indicator that shows whether the unit is ready for use. And the sprays are not intended to replace a standard extinguisher (NFPA 10 compliant) where required, as the makers say on the labels. The sprays sometimes made the grease fire in our tests flare up before they put it out. That could cause the fire to spread or prompt the user to stop the spray. We found that two of the 10 Tundra samples didn't properly discharge. Consumer Reports did a poor job in the testing. According to the NFPA, Class K Wet Chemical is the only agent recommended for grease/cooking oil fires. Ironically the unit Consumer Reports recommended does not meet UL 711a (residential cooking equipment standard) and our Kitchen Guard has been third party tested and verified to meet the standard. @ Richard - We want to make sure that our community who stops by our site and sees your comment understands your true intentions. You would have them believe that you were about to purchase this product and are a normal Daily Grommet visitor. We have strong indications to believe that this is not the case. We strive for transparency on our message boards which is why I have chosen to address this unique situation in this manner. We will let your comment stand. We would have let your comment stand had you said 'I am in the industry and I've read this review of this product." We just want to make sure that our visitors understand that you have an interest in discrediting this product. We are happy to have Amy here to be able to respond directly to this report. * post removed for non-compliance of message board policies. Exactly. If dry chemical extinguishers are banned in restaurant kitchens why would it be something a consumer would want to use in their own kitchen? 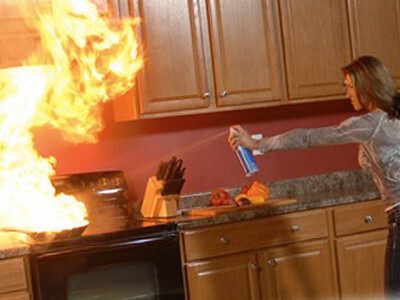 Longer discharge time, cooling and wetting capabilities to keep the fire from reigniting and easy to clean up are the benefits of using an aerosol fire extinguisher in the kitchen. I like the fact that your product is made in the USA. All the fire extinguishers I see in the stores are made in China or Mexico. I like to support American jobs so you can bet I'll be buying your product. Looks to me you have a great firefighting product for the home. Sounds like Richard works for the competition and is getting a little to technical. Great idea! My question is - How many uses does a can provide? 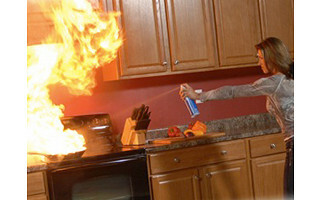 Our products are intended for single use just like all other standard fire extinguishers designed for kitchen fires. I really was about to buy (its still in my cart) and thought I would google first since some of the things I have bought from DG have been great, and some a complete bust (see battery recharger eg). I was especially concerned since this is a product that you can't test in daily use. I wouldn't call a Consumer reports "Don't Buy" a "bit too technical". I was really looking for a response. the above sound like plugs by DG or manufacturer. We don't mind people posting negative or positive reviews of a product. Negative reviews give our Grommet partner a chance to directly address concerns that may have come up with their product in the past. Positive reviews allow those who have had a good experience to share their first-hand experience with everyone. All discussion is valuable and is important to a purchasing decision. We do strive for transparency on our message boards. So if we were to find out that Richard is a competitor (he absolutely is not, by the way, he's a longtime cherished customer) or that false positive reviews are posted, we will do our best to make things right for those coming here for accurate, unbiased information. Thanks Amy and everyone else for being with us today. @Katherine Klinger Where can I buy it? @ joan - You can buy it right here! If you click on the product image at the top of this page it will bring you back to the main page for these products. Just to the right of the video is where you can buy it. Imagine fire-fighting tools that are smaller, lighter, and easier to operate than traditional fire extinguishers. That’s exactly what Shield Fire Protection has created. The company’s aerosol spray cans contain fire suppressants designed to fight specific blazes. Kitchen Guard is formulated for cooking oil and grease fires, and Home Guard is engineered to tackle common household fires involving wood, paper, fabrics and plastics. The parent company of Shield Fire Protection, founded by Tom Bower, has been making fire-extinguishing products in the U.S. for more than 40 years. The agents inside its aerosol sprays have been proven to work in commercial and industrial environments. Kitchen Guard contains the same extinguishing agent used by restaurants to protect deep fat fryers, and Home Guard contains the agent used by fire departments to fight fast-spreading forest fires.